It was our penultimate day in Guyana, and I was walking among the stalls inside the public market in Bartica. Glancing to one side, I barely registered a woman sitting in one of the stalls, a large embroidery hoop in her hands. 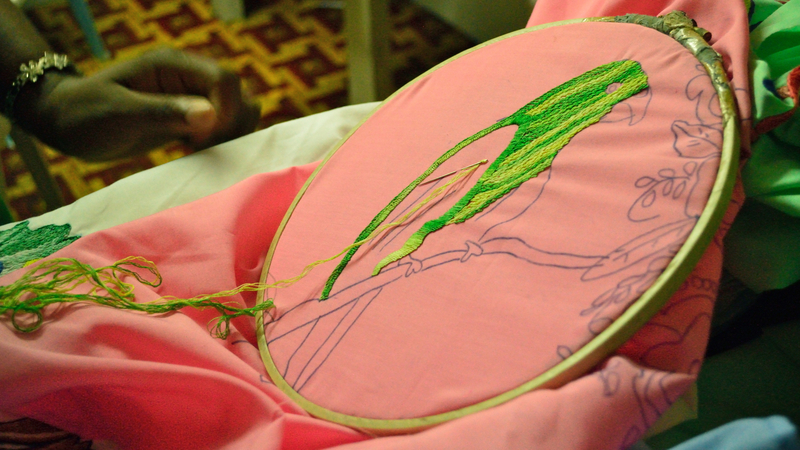 I had gone several metres past when it hit me: she’s embroidering! I turned right around and went back. Naomi Drakes is 32 years old, a single mom with an 11-year-old son. 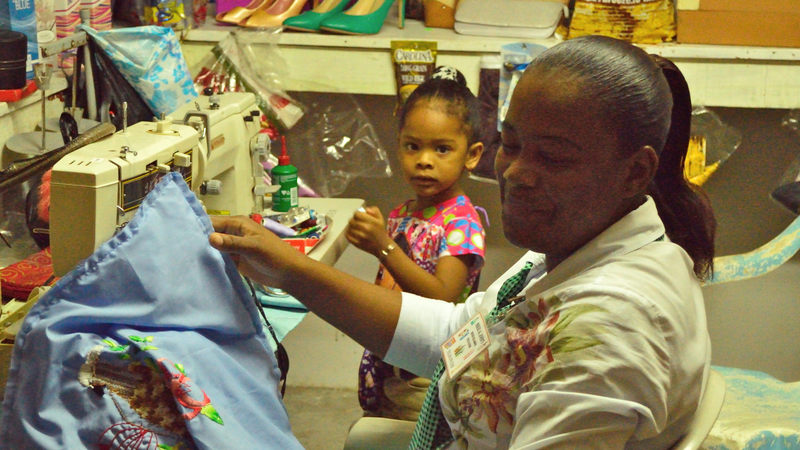 Her family runs several stalls within the Bartica market; Naomi and her sister run a stall selling haircare products, fashion accessories and, by the looks of it, they do minor alteration work using two sewing machines, as well. I asked Naomi if she would consent to a short interview and some pictures of herself and her work, and returned the following day with a camera. I tried to shoot a video of the interview, but the gloomy, greenish atmosphere inside the poorly-lit market produced a very poor video, and the ear-splitting roar of the town’s power station, which is next door to the market, drowned out her voice. So I have had to content myself with a few photos and some stills from the video. I found Naomi to be a confident, articulate, and industrious young woman. On days when business is quiet at the stall, rather than gossip with her neighbours or kill time on her phone, the enterprising lady does her embroidery. Her large pieces (average size of her pieces is about 30 cm. in diameter (a foot) adorn bedroom pillowcases and decorative ‘towels’ (draped over furniture and such, not the kind used to dry things). 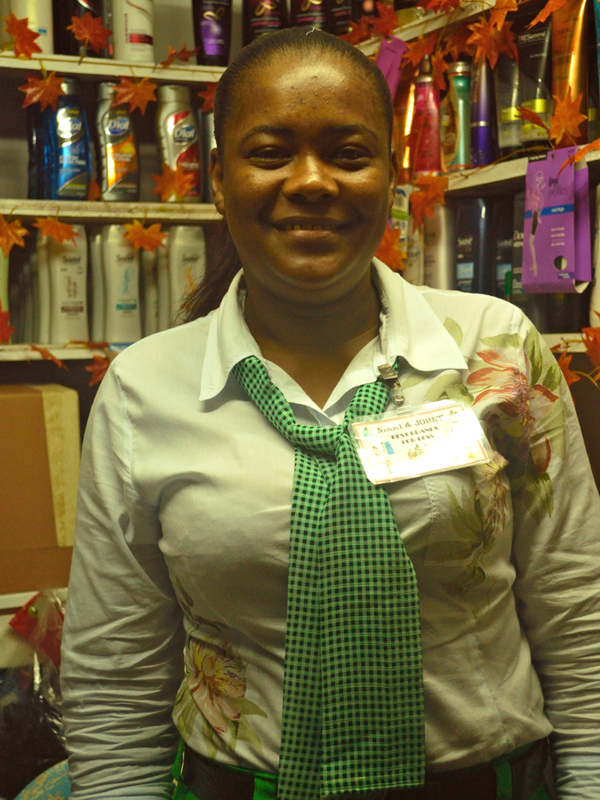 Her work is popular, and she has quite a lot of orders from locals in Bartica. She leaves her embroidery projects at work, because she knows that if she took them home, she’d want to do nothing else, so clearly she enjoys embroidery. Her designs come from things she sees in books, or sometimes she might ask a friend who knows how to draw to design something for her. I asked her what her favorite stitch was, but she couldn’t pick one…she knows many, and each one is good for achieving a particular look. 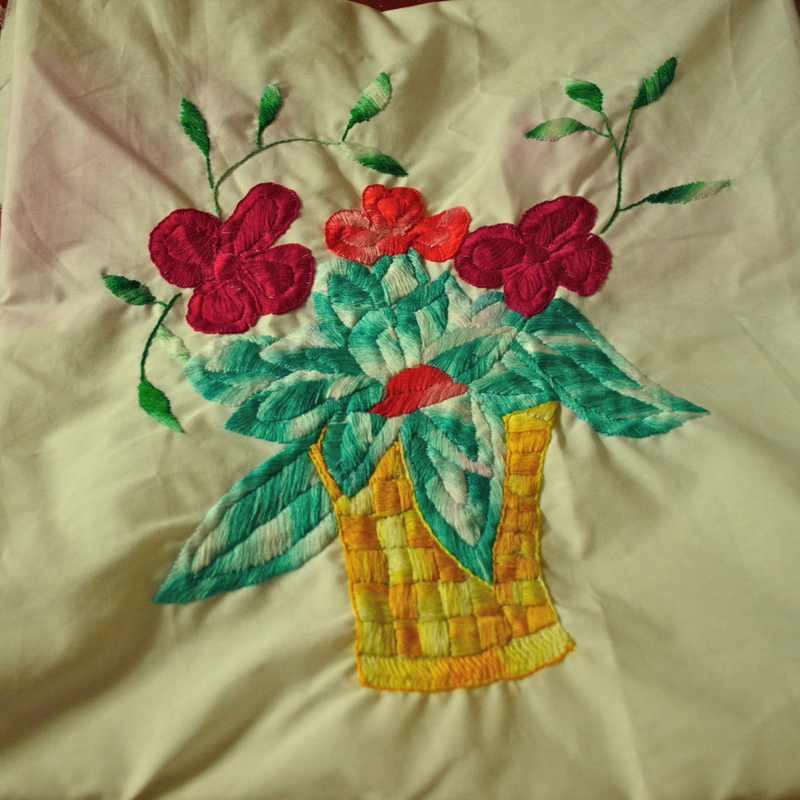 She learned embroidery from her mother, but is the only one of her sisters who pursued it seriously. Embroidery floss is expensive in Bartica, so she gets her materials from Georgetown. How much does she sell her work for? 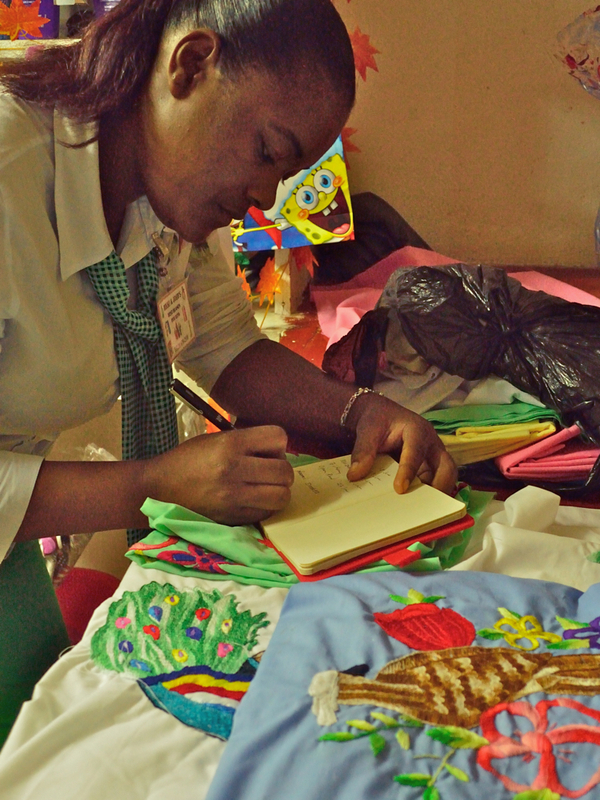 A pair of pillowcases with a matching design, plus all the sewing and ruffles that she adds with her sewing machine, goes for G$ 3,500.00. That’s US$17.50. I was horrified. “And the towels?” I asked… “the towels are G$2,000.00 (US$10.00) each, if I supply all the materials. Apparently, if a customer brings her own fabric for Naomi to embroider, it is cheaper. 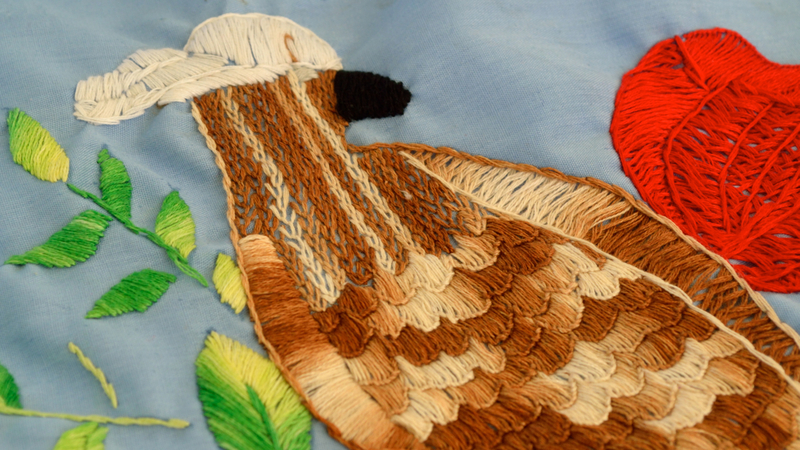 Each embroidery takes between 5 days and a week to stitch. 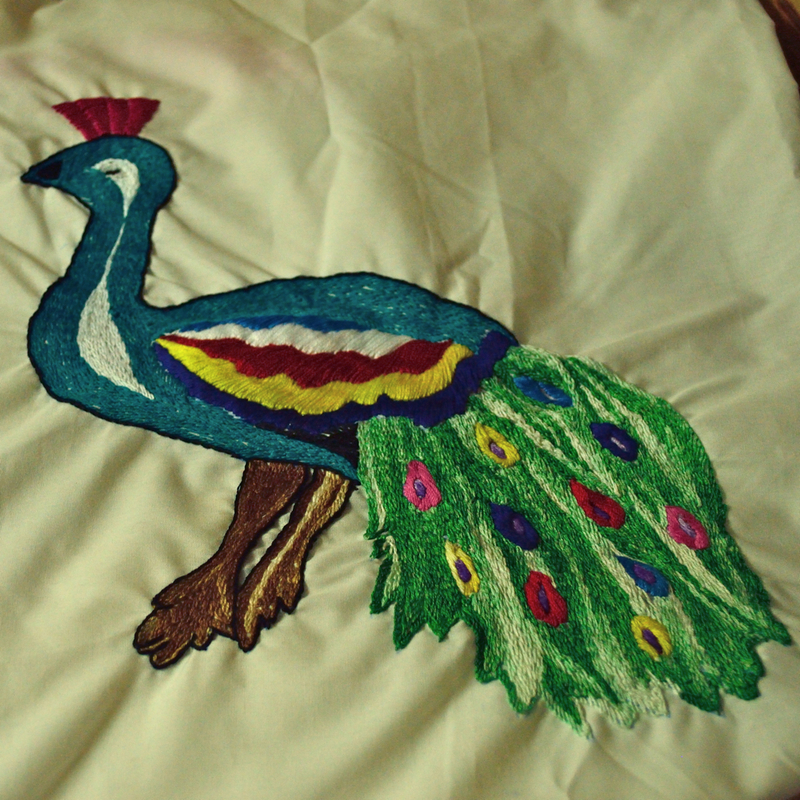 I protested that this was much too cheap for the amount of work she puts into each embroidery, but she reasoned that she would be sitting in the market all day, anyway, and a pair of pillow cases brings her an extra, unexpected G$3,500.00 on top of what she earns by running the stall. Fair enough, I suppose. I asked Naomi to write her postal address down for me, and I look forward to corresponding with her when I get back to Australia, maybe send her some embroidery goodies, books and such, because, despite the very different sort of work that we do, I felt such a kinship with this remarkable young woman who, in a money-and-gold-crazed mining town, and with very limited resources, has managed to nurture a serious love for the craft. Lovely work . . . so natural. Just gorgeous! I can only imagine the love and determination it took to develop her talents. Thank you for sharing this inspiring story! Love the story of Naomi. 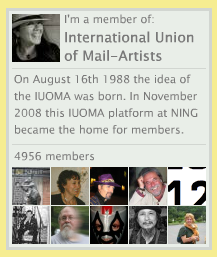 I would be happy to send her a little surprise parcel if you wish to pass on her name and address. Must keep our creativity alive and well. Jenn, I’ll try and pass the message on to Naomi, she should hear what people outside of her hometown think of her work, I’m sure it will open her eyes to her own potential. Thanks for reading! Inspiring. So glad you gave her support, encouragement and business! Me, too! She was lovely, articulate, mature, I was so taken with her confident, open manner. I agree that she’s selling her work cheaply for the investment of time and skill involved but if she’s content then I guess it’s up to her. I can barely sew at all so I’m in awe of her skill. The problem is that she is “marooned” in Bartica, where nobody would pay more for such work. As she points out, it’s additional income using up dead time while minding a shop, so I guess it sort of works. If she could sell beyond her hometown boundaries, I am sure that she would learn the value of her own work, but she has no internet access and she has no idea who/what is “out there”. 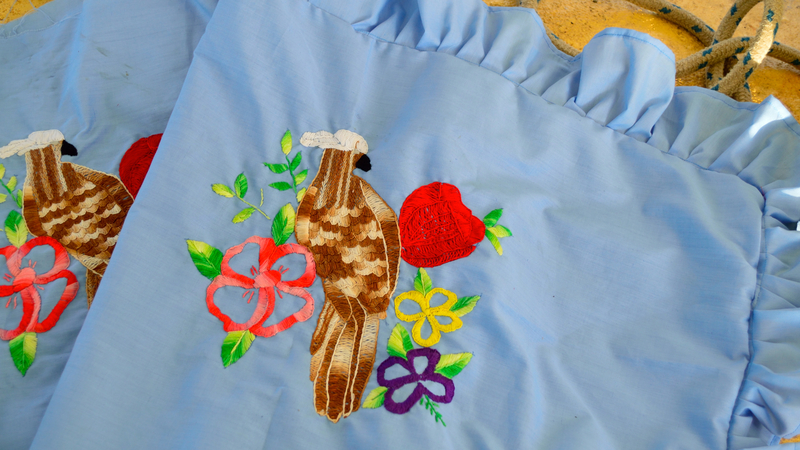 So nice to see the stitching close up too…beautiful. This is so heart warming. I love all your posts from your travels. I don’t know if it would be helpful but I have a bag of new assorted embroidery threads sitting doing nothing other than looking delicious in my house. I would be happy to send to Naomi. I got them all in India and I don’t see me getting around to embroidering anytime soon. Not for the next ooooooh 5 years 😉 There is every colour you could ever think of. It would give me a lot of pleasure to give them to a fellow maker and creator. If you prefer I can send them to you and eventually you can send them to her or if you let me have her address I will send them direct. I’m sure you get my email address in the sender’s details. Let me know in the comments if you don’t. Happy continued travels. It’s all so delightful and slightly other worldly to read. London is so noisy and dusty and the little window into your adventure is a delight. Thank you for continuing to post through what must be very trying internet access. Following but not always commenting. I think that makes me a lurker! Loulou, you’re the nicest lurher ever. 😉 I will e-mail her address to you, fingers crossed the parcel gets there, I have not had a chance to test it, myself, yet. She’ll be stunned and baffled if readers start to send her stuff, but I am sure she’ll put it to good use (like you, I have enough thread to last a lifetime, given how little I do) I just wish there was a way to see what she makes of it all. Maybe someday she’ll learn how to use a computer at the town’s only internet café, or get someone to send us some pictures…either way, though, it would be lovely to send her things.